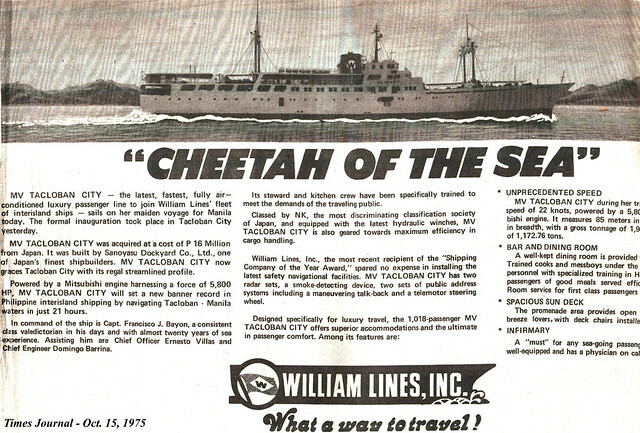 When I first saw the MV Tacloban City of William Lines in the late 1980’s, I did not think much of her. She looked small and having ridden small ferries already I thought she had not that much to offer. Among liners then in the North Harbor she was among the smallest already in the league of the MV Palawan Princess of Sulpicio Lines. The MV Don Julio of Negros Navigation certainly looked bigger. Of course, there is no comparison to the other ferries then in North Harbor except for maybe those owned by MBRS Lines, the MV Salve Juliana and MV Romblom Bay which were actually overnight ships from Manila. If there is something that makes the MV Tacloban City look small it is because of her thin beam. ROROs even though shorter than her like the Moreta Shipping ROROs in North Harbor like the MV Nikki and the small MV Surigao Princess of Sulpicio Lines looked bigger or equal because of “fatter” beams and of course ROROs for the same length are generally higher because RORO decks and ramps have to be tall enough for the vehicles being loaded including container vans mounted on trailers. Later, when I was able to sail with the MV Tacloban City as the MV Sampaguita Ferry in Zamboanga City, I found out she had more to offer that I previously thought. She was a liner after all before and she retained all her amenities even though she is just being used then as an overnight ship to Pagadian City. Like her fleet mate MV Iligan City, she has practically everything except that it seems everything is miniaturized and one is thrown back imagining the liners in the past when they were still smaller and shipping companies were trying to maximize passenger capacity for the growing population and passengers of the country. The MV Tacloban City came to the country in 1975 and she was a cruiser. In those times there were no RORO Passenger (ROPAX) ships yet and it was still the time of the cruisers. Cruisers were “thinner” the ROPAXes for the latter need the bigger beam to balance its taller superstructure. Cruisers meanwhile were designed to slice through the water and hence they were thinner. They thus had only one engine and one propeller compared to the usual two of the ROPAXes for the same length. Sitting lower on the water, cruisers tend to be more stable. However, they tend to rock a lot in port when their booms handle cargo especially if it is a container van. When the MV Tacloban City came to the country she was only the second fast cruiser liner of William Lines after the legendary MV Cebu City which arrived brand-new from Japan. 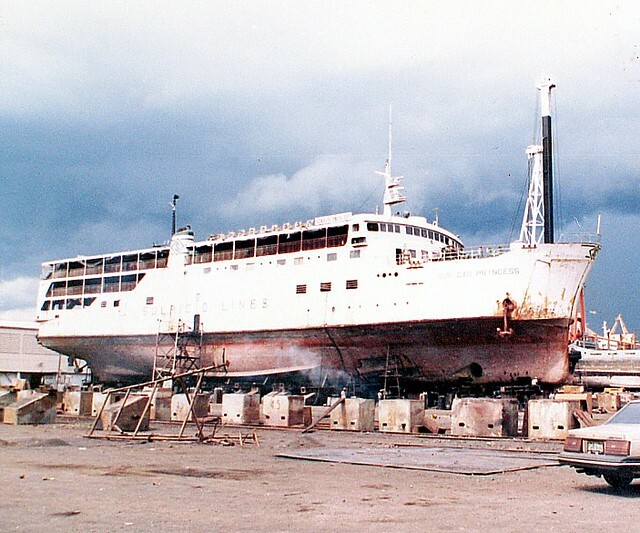 The MV Tacloban City was a second-hand vessel, a recognition of the changed economic circumstances of the country when the economy and the exchange rate worsened significantly starting the first half of the 1970’s which made acquisition of brand-new ships impossible already for it already cost a lot. Furthermore, credit and availability of foreign currency were already tight during those times especially after the Oil Shock of 1973. The MV Tacloban City was a ferry built in 1962 by Sanoyasu Dockyard in Osaka, Japan for Oshima Unyu. The ferry was then known in Japan as the MV Naminoue Maru. She is of steel hull with raked stem and a cruiser stern and two masts (boom looks like a third mast, however). The ship was assigned the IMO Number 5246295 later. The ferry had a length over-all (LOA) of 91.1 meters, a beam of 12.8 meters, an original gross register tonnage (GRT) of 2,244 tons and a deadweight tonnage (DWT) of 1,171 tons. She was powered by a single Mitsubishi engine of 5,800 horsepower and her original sustained top speed was 19 knots. This ferry was launched in December of 1974 and completed in March of 1975 and she was used in the route to Oshima Island southeast of the main island of Honshu before she became part of A” Lines (which means she must have been designed for stability). William Lines acquired the MV Naminoue Maru for P16 million which was roughly $2.2 million dollars then. With her coming to the Philippines additional structures were built on her like what is usually done to increase the passenger capacity and to build additional amenities. In conversion to gross tonnage (GT) the cubic size went down to 1,965. The new net tonnage was 767, the depth was 4.7 meters and the deadweight tonnage (DWT) was 1,173 tons. The formal inauguration of the ship was on October 14, 1975. The ship’s name was a homage to the city she will serve which was the new style then already of William Lines to name their fast cruisers for the city they will serve (as compared before when their ex-”FS” ships were named after the sons and daughters of the founder William Chiongbian). The ship initially had three passenger decks with a passenger capacity of 1,018 person. With that, she was one of the earliest passenger ships in the country to breach the 1,000-passenger capacity mark. Later, a half-deck for passengers was built at the bridge level and increasing her passenger capacity to 1,274 persons. 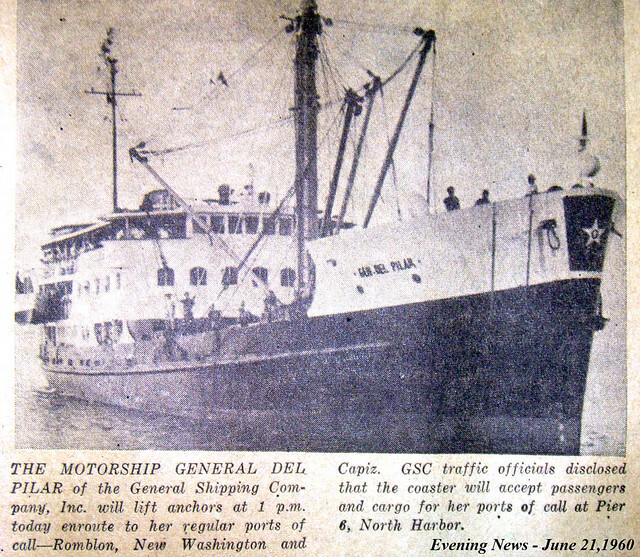 Upon fielding in the country, the MV Tacloban City was used in the Catbalogan and Tacloban route from Manila. 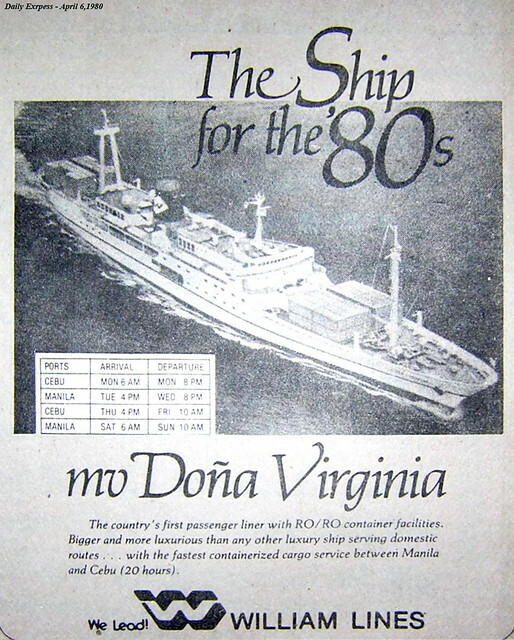 This was the next foray then of William Lines in Eastern Visayas after an earlier putative attempt using the MV Elizabeth, an old former “FS” ship without air-conditioning which was heavily outmatched by the better competition like the MV Sweet Grace, MV Sweet Rose, both of Sweet Lines and the MV Dona Angelina of Sulpicio Lineswhich all had air-conditioning (there were also lesser passenger-cargo ships without air-conditioning to Catbalogan and Tacloban then). This was the time when there was no road and intermodal connections yet to Eastern Visayas from Luzon, the time when liners were still the king (or better yet queen) to the region. When the MV Tacloban City was fielded in the Eastern Visayas route suddenly William Lines had parity with the better competition. In terms of size, the MV Tacloban City was just about the size of the better competition and in amenities, accommodations, food and passenger service they might have been in rough parity. What her advantage then was she was the speediest among the liners with air-conditioning to Catbalogan and Tacloban and William Lines harped on that by calling her the “Cheetah of the Sea”. Cheetahs of course are known for their bursts of speed. And in the direct route to Tacloban, the MV Tacloban City sailed the 363-nautical mile route in only 21 hours including the slow passage in San Juanico Strait with its many shallows and sandbars. For a long time MV Tacloban City’s cruising speed was 17.5 knots which can match even some of the liners of today. The MV Tacloban City served the two Eastern Visayas cities for more than 16 years, one of the ships to serve a route the longest straight and long after her initial competitors had long been gone from the route and even during the time when the intermodal buses and trucks had already been rolling to Samar and Leyte through the short-distance ferry-ROROs traversing San Bernardino Strait. She was only removed when MV Masbate I took over her route and she was transferred to the Manila-Ozamis route via Pandan of Antique. A little later she was again shunted to the more minor Manila-Dipolog (which is actually Dapitan) route via Batan, Aklan, an ignominy often suffered by older liners. She was holding this route when the William, Gothong & Aboitiz (WG&A) merger took place on January 1, 1996. When that merger came the MV Tacloban City was relegated to the regional subsidiary Cebu Ferries Corporation or CFC where she was assigned the Cebu-Roxas City route. That route did not last and the next year, 1997, she was offered for sale along with many other cruiser ships (along with other ROPAXes) of WG&A and Cebu Ferries Corporation. In the same year the expanding Sampaguita Shipping Corporation of Zamboanga City snapped her up and she was fielded in the Zamboanga City-Pagadian route with almost no modification. She was renamed into MV Sampaguita Ferry but she is generally regarded as MV Sampaguita Ferry 1 with the acronym “SF1” (and I wondered if WG&A ever complained). It is here in this route that I was able to sail her in 1998 with my late mother after visiting my brother in Zamboanga City. We were in Cabin and though small by the cabins of the day it was still respectable. I was not able to roam the ship much as we were already tired and I have to tend to my elderly mother. That was the time when Zamboanga port still had no expansion and so many motor boats were using that port (along with so many small cruiser ships as there were still a lot of shipping companies still existing then in Zamboanga). We were only able to board near 11pm and with great difficulty. Only the bow portion of the ship was able to dock due to non-availability of wharf space and we passengers have to clamber over the ship not via the gangplank but over the bow through a ladder and that was difficult for my mother. The long wait at the port even added to our tiredness. And that Cabin which was among the best at least among the Zamboanga local ships was a welcome respite. Even at a very late departure because the ship was not able to leave immediately as cargo still has to be loaded, we still arrived at a reasonable 8am in Pagadian. We had a good night’s sleep and actually we were already asleep when the ship left port. I had no camera then but before leaving port I took a long look at her capturing in my mind her lines and stance. I did not know that will be the last time I will see the former MV Tacloban City. Not long after, Sampaguita Shipping Corporation (SSC) ran into financial trouble not entirely of her own creation. The Zamboanga-Pagadian highway improved when before it was more of a bumpy and dusty ride with danger from bandits, the reason why some prefer the more expensive ship especially the wealthy (and that is why there is patronage for the Cabin class that started from the MV Lady Helen of SKT Shipping. More trucks rolled too and slowly the cargo and the passengers of the Zamboanga City-Pagadian ships started to evaporate. With its new ships financed by bank loans and with revenues drying, Sampaguita Shipping went belly up and her mortgaged ships were seized by the banks including the MV Sampaguita Ferry and she was anchored. 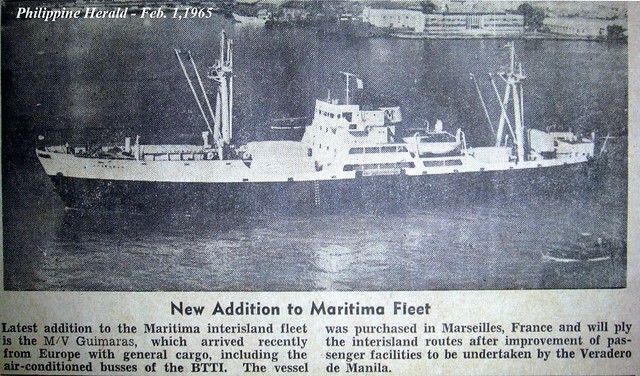 Later, she disappeared along with the former MV Iligan City, also of William Lines before. Tale in Zamboanga City says the two sailed for Cebu City for breaking but I doubt the story. The two could have easily sailed south to meet their fates with the ship cutters. By that time there were no more buyers of cruiser ships anymore as they were already obsolete for most routes. In international maritime databases there is no information on the final fate of the former MV Tacloban City.